At the time it was released, Waterworld was the most expensive film ever made, and as of today, still ranks #7 when adjusted for inflation. It is considered one of Hollywood's biggest flops (although it actually did turn a profit worldwide), which is a shame, because it probably discouraged a lot of people from watching it, and it isn't half bad. So the plot goes like this... the polar ice-caps are melted and the world is covered in water. Survivors live in communities on islands constructed of floating debris. The character played by Kevin Costner, whose character is never actually named, is a drifter visiting one of these communities when it's attacked by pirates, called "smokers" because of their gas-powered vehicles and an incomprehensibly endless supply of cigarettes, considering that vegetation of any type is scarce in this post-apocalypse. Costner escapes with the help of a woman and girl in that community... problem is, it seems to be the girl the Smokers were after, and a chase ensues. The cold harshness of this world is projected through Costner's character, who shows little reluctance to throw his passengers overboard when it becomes clear the three of them cannot survive. There's little to like about living in Waterworld or Kevin Costner, and that's what drew me into it initially. But while Costner is playing a harshly realistic survivor... Dennis Hopper, as the Deacon, is a cartoon character in comparison. Don't get me wrong... I like the character... I just wanted a little more consistency from this movie. The Deacon scenes feel out of place after buying into the hard reality of Waterworld. On the other hand, I think the movie could have worked just as well on a slightly more fantastic world where Kevin Costner smiles once or twice and doesn't threaten to kill little girls for telling him he needs a haircut, and I could have appreciated the Deacon a little better in this film. In the end, Costner's character embraces his inner action hero, and the climax of the film is a very by-the-numbers Hollywood action scene. If they had stuck with that throughout the movie, it might have been more successful. I still really liked it, and wish I hadn't waited over fifteen years to see it. Thanks be to Netflix. 3.5/5 stars. 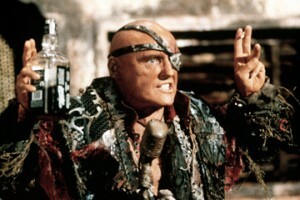 I loved Waterworld. Yea, Hopper hammed it up in that role, but i still found him to be entertaining. Also, i dont get how people consider this a box office flop when it totaled 265 million in box office grosses. Costner gets a lot of crap along with this movie, but it's an okay one. I agree, for an action-adventure movie, its not a terrible way to waste a few hours. I'd go so far as to say I enjoyed it more than Avatar. I live close to Waipio Valley were they did a lot of filming for it, and the set pieces are still out in the water there. A large part of the over-spending on the movie was caused by Hurricane Iniki, which is the strongest (& pretty much only) recorded hurricane to hit Hawaii. Just their bad luck!